Preheat oven to 350 degrees and butter an 8×12 casserole dish. Coat a large sautée pan with 2 tbs Olive Oil. Add the garlic and onions and let cook until they start to soften. Add the carrot and celery with sage and cook 10 minutes. Add mushrooms to mixture and cook until veggies and soft. Mushrooms will brown. Remove sage leaves. Transfer the ingredients from the pan into mixing bowl. Add bread and ¼ cup olive oil and toss to coat. Add 1 cup of veggie stock and stir. Transfer to a casserole dish. 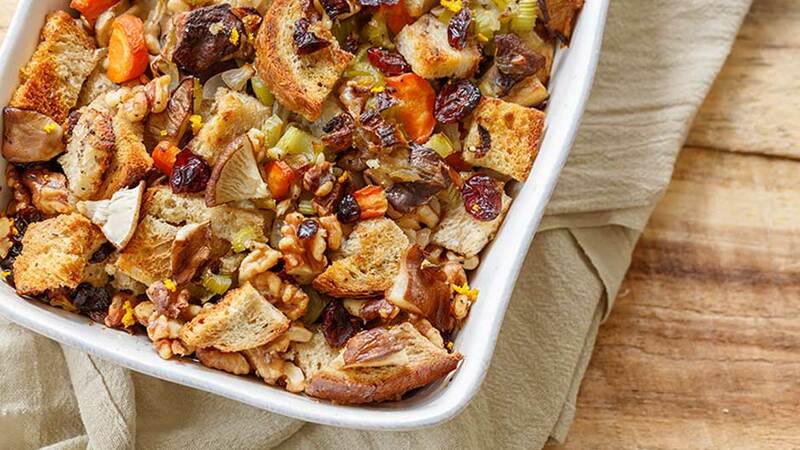 If the stuffing seems dry, add more veggie stock. Add a layer of the orange zest and dried cranberries atop the stuffing and bake for 35 minutes or until golden brown.